The Inside! And, I Need a Little Help | T.O.T.E. Yesterday, Mo and I spent part of the morning at our house, adding the necessities for the next several weeks. You know: TP, paper towels, and a Pooh Bear pillow-pet. What? That’s not a necessity? Mo begs to differ! Pooh is, in fact, one of the only words she can actually articulate at the moment. The more I’m at the house, the more I love it! I snapped some photos of the empty inside in order to get some help. Yes. From you. See, the house is yellow. All yellow. Inside. Outside. Upside-down (name that book all you Mamas out there). Which is fine. I love yellow. Some of my favorite things are yellow: the sun, sunflowers, sunshine…and did I mention the sun? However, the inside is three distinct shades of yellow. Kind of an ochre in the livingroom. Pale yellow in all the bedrooms, the hallway and the kitchen. And a greenish-neon yellow in the TV room. You’ll see what I mean. So, we have some painting to do, and the reality is that Andy and I are way out of our element. I desperately need my very artistic sisters or mother to help us out (and any of the rest of you with an opinion!). I apologize in advance for the different picture sizes and qualities. Question #1: Should we leave the front living room ochre? Question Number 2: Am I crazy? There are two small bedrooms (with the cutest window seats). One will be for the girls, the other will be a guest/craft/misc room. Here’s the crazy part where perhaps I need a little input. For the girlies, I have the following in mind: paint the bottom half of the walls green and the top half blue. Then I can paint a palm tree and monkey in a corner. He he he! And we can get this RC powered solar system mobile for the ceiling (which I just found out thinkgeek.com is no longer selling, boo!)! Too much? If not, what shades will match the red-ish wood floor? The kitchen/dining area will be left as is. I enjoy the pale yellow here; it’s cheery. That’s important when it’s always grey outside. 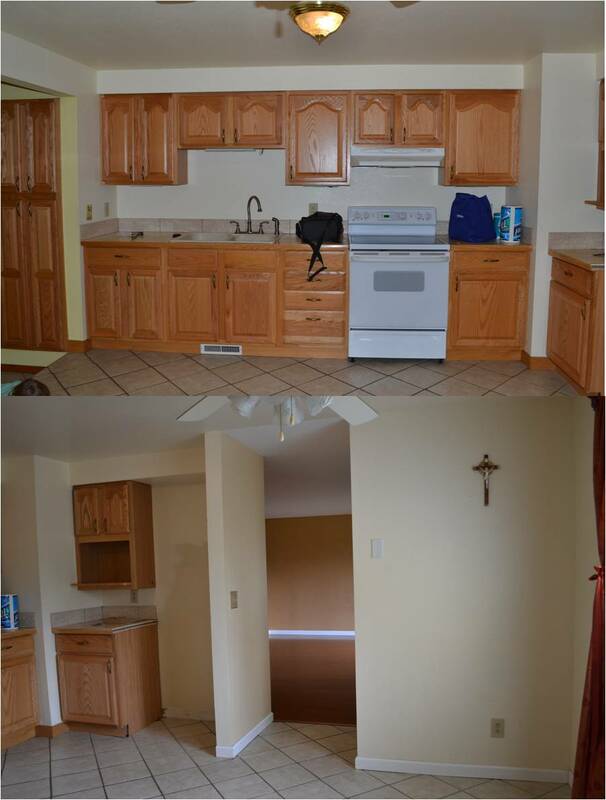 We might do a little wainscoting in the dining area, just to make it stand out a bit, but nothing major. Question #3: What to do with our neon TV/Livingroom? By way of transition and comparison, here’s a pic from the kitchen looking into the TV room (please ignore the angry Mo. And, yes. She does get angry/grumpy/sad/frustrated sometimes. Especially if I’m not doing exactly what she wants. Which, in this case, is going outside to pick dandelions…). See the neon-ness of that living area compared to the calming yellow of the kitchen? That, my friends, needs to change. Here’s the same room, with the slider to the outside. The yellow really is as neon as the above pic. We have a pellet stove along the far wall you see here (that’s a shared wall with the kitchen for those of you trying to keep perspective in this super unorganized post). We’ll paint the trim white. Take down the butterfly wall paper and plaid curtains. But then what to do? Any color suggestions? Thanks for “listening”. It seems like a lot to take on at 28wks preggo, with an almost 2 year old, and with a husband who works full time…I’m just glad we have awesome friends and family who are willing to help (Hint, hint. Nudge, nudge. Wink, wink). Hi Jess! I love your house! The back yard is wonderful, especially! I agree with you that the neon yellow MUST change. It’s quite awful, but the cheery yellow in the kitchen is quite nice. As for the girls room, I’m not sure that doing two paint colors is your best bet. I feel like doing one solid paint color will be more satisfactory. I might suggest a medium gray. Gray might seem too gloomy for some people (especially in Washington, when the sky is gray more often than not), however, gray is really easy to coordinate with. You can brighten up the room with some fun colors in the bedding and the art. The window seat could brighten up the space with a bright upholstered cusion, and then the gray could anchor the whole spot. I like gray for a bedroom also, because even with bright colored bedding and accessories it’s a very calming color and will help the girls fall asleep. And really, you can accent gray with ANY color under the sun. So whatever Mo’s favorite color is, you’ll be set! 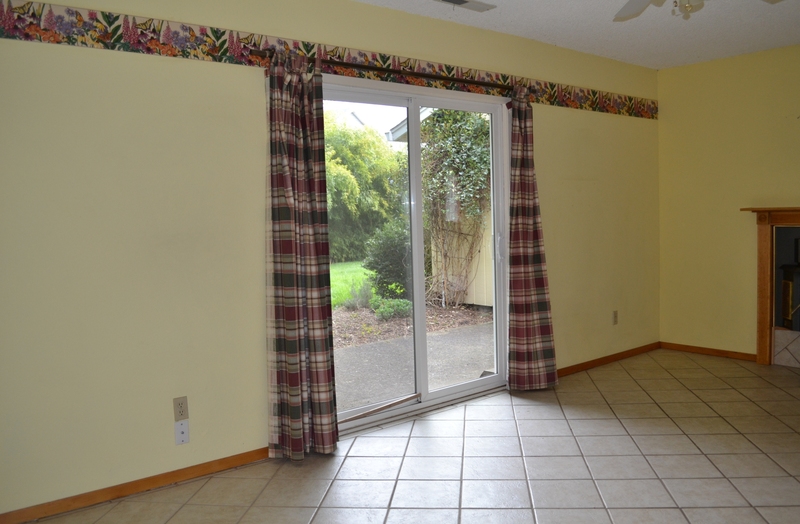 As for the TV room… this one is tricky, because I can’t really tell what color the tile is. I think painting the trim white is a great idea. And PLEASE get rid of that wallpaper. 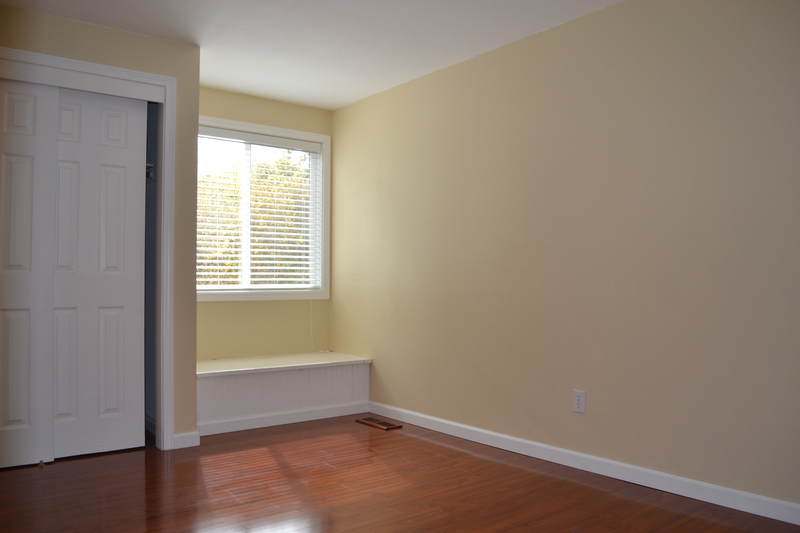 If it were me, I would be inclined to paint the room a warm neutral color, like a light beige, something closer in yellow or orange in undertone (than opposed to blue or green, and probably not red). Then I might consider painting the wall with the doors an accent color. The accent color will be determined by what will coordinate with your furniture, so again, choose the main neutral based on what you own and what will go in the space, and then find an accent to compliment that color. Other than that I think the house is great! I think the color in the future play room is just fine, I don’t see a need to paint that at all. It’s a perfectly pleasant neutral, and I think your efforts are better spent elsewhere. I hope all is well, and that you don’t mind this super long response to your request for help! Great advice! Thanks so much Alyse! I totally should have thought of messaging you directly! I love your idea for the little kiddos’ room. Still coming up with my suggestion for the room with the fireplace. The house is really cute. I like the room with the furniture. The only thing I do when selecting colors is get quite a few samples of the colors I think I want tape them together in large same color segments then tape them to the wall or walls I want to paint then I keep looking at them for a few days and choose the one my eye keeps going to. This also gives you a chance to see how they look at different times of the day. Enjoy your home and we miss all of you. You can upload your pictures of your rooms onto Sherwin Williams’ website and virtually paint your rooms to get an idea of the colors you like. Depending on your computer monitor, it won’t be exact, but at least you’ll know what shades look good with the surroudings. I definitely wish we had taken our time a little more choosing colors. If I had to do it again, I would have painted samples on the actual walls and observed them at different times of day. (i ended up with fluorescent green in my kitchen somehow and had to re-do it all!!) It looked right on the paper strip of colors, but not so in real paint-life.